Grenada’s former Junior Olympian Josh Boateng has been named Co-Field Athlete of the Week by the Lone Star Conference. 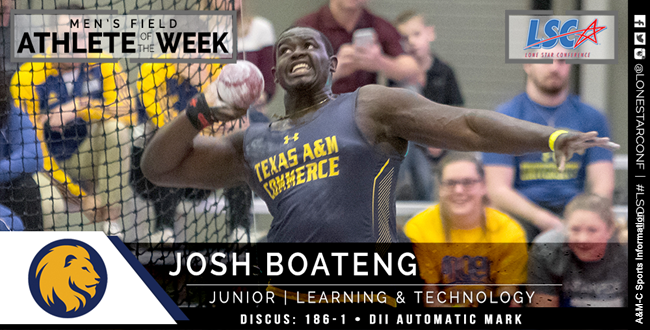 Josh Boateng, Texas A&M University-Commerce, JR, Learning & Technology, St George’s, Grenada, earned an automatic qualifying mark, provisional qualifying mark, and two event wins in the inaugural East Texas Quad. In the discus, Boateng earned an automatic qualifying mark with the nation’s longest throw this season at 186-1 (56.73m), which also places him in the top 10 this year in all divisions. In the shot put, he launched the shot 57-7.5 (17.56m) for a provisional qualifying mark, the second-best in the LSC this season, and eighth-best in the nation.